Your business most likely has existing customers who are satisfied with your products and services, so why not take advantage of the opportunity to extend your customer base with an effective, formalized referral program? Sometimes called “word of mouth” marketing, developing a referral program within your overall marketing strategy can optimize something that probably already happens when your customers have a good experience — they tell their friends. A referral program simply expounds upon that interaction, and provides the customers who refer and the referred leads a bonus for that transaction. They give you access to a community of consumers you might not otherwise reach. Leads through referrals are generally better quality leads, because they already have a point of contact with your business, referred ideally after the initial customer has had a good customer experience. Referred customers are generally less sensitive to pricing factors than a cold lead. Most referral programs require a low-cost investment that offer a big payoff. They allow you to keep more customers. Your business will grow with a wider network of potential customers. 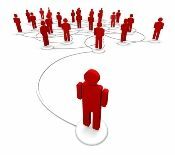 They provide an easy, streamlined way for customers to recommend you to people within their circle of influence. Referred customers feel more at ease selecting you as a provider, because someone they know (well) has referred them, and they trust that opinion. Customers could receive a reward for referring. Referral leads could also be given a bonus or discount for trying out your products or services upon referral. Referral programs that allow you to optimize the relationships your customers have with friends and family gives you an edge, and you get more bang for your buck than cold calling or generating leads that don’t already hold a connection with your business. Continuity Programs’ line of turn-key marketing solutions will take your marketing strategy from lackluster to heavy hitter, customized to your unique needs.